When students dispersed after the first assembly of the academic year, in order to save paper, they were instructed to fill out their own schedules with the help of Skyward. Soon, the high school hallways were drowning with loud chattering and hysterical shouts. Many had five classes a week; normally, one would have five a day. It was soon understood that there was a glitch in the system and that the information on Skyward was incorrect. Therefore, while the Copy Centre printed out new schedules for the students, resulting in more paper consumption, students were made to watch Into The Wild in Parker Hall. Woodstock had changed its scheduling system from a one-week schedule to a two-week (Week A & Week B) schedule. Students and teachers expressed both their likes and dislikes of this new system; however, many were left oblivious about the purpose behind this change. A few of the major inconveniences with the schedule change are students having four classes in a row, clustered study halls, and the inability to focus during the block periods. “For the first time at Woodstock, since I’ve been here at least, I had four classes in a row … and that’s kind of a killer,” said Kritin Garg, Class of 2019 and school president. He has been here since fourth grade, since 2010. On having four classes in a row, Mukhtar Mohamed, Class of 2021, too shared the same concerns. “You have four classes after lunch, so that’s bad. Lunch should always be on the fifth period,” he said. Mr. Richard Davies, the upper years’ coordinator, was involved in creating the new schedules. Mr. Davies showed an acute awareness of the situation. He assured the students that the school is looking into this and trying to bring in some fixes. 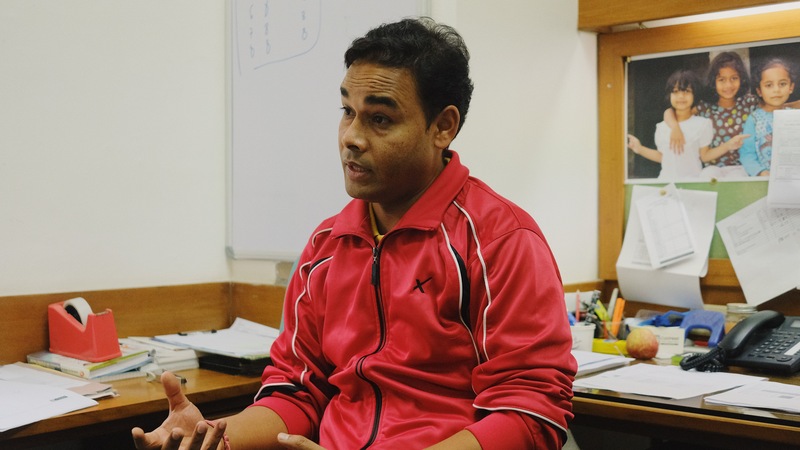 On the other hand, Mr. Ajay Negi, school registrar, explained that having four classes after lunch is actually not a problem if teachers could accommodate the classroom settings to make it easier for the students. “If teachers could give [the students] like a ten minutes break in between those blocks, that will help ease students out,” he said. Another major recurring problem amongst the students is the clustered study halls. Several students seem to have an issue with the balance between classes and study halls throughout the week. Similar concerns were brought up by Ansh Vora, Class of 2019. “The study halls could be spread out. It’s like you have seven classes in one day, and then on another day; you have six study halls,” he said. And not only are the study halls clustered, several students have coinciding study halls, which makes the library and the senior lounge very congested during certain times of the day. For example, the library is almost a fish market during period 2 on Day 7. Mr. Negi and Mr. Davies both explained that this is not the long-term plan. They said that this issue arose because of the complexity of the new system, as well as the shortage of time for coming up with the new schedules. “It was a long process. It took my whole summer vacation to communicate with both these companies to come up with a final solution,” Mr. Negi said. Mr. Ethan Van Drunen, vice principal, explained that there were several technical difficulties with the time-table company; therefore, there was insufficient time to deal with the obstacles that came up. Edval delivered its finalized schedule on the July 13; however, work for Mr. Negi and Ms. Sonal Talaulikar, who works in the junior school office, did not end there. Due to school starting on the 18th, Mr. Negi dedicated all his time between the 13th and the 18th on shifting the data from Edval to Skyward. “From 13th to 18th of July we had to input all the data we got from Edval into our software. We were really working day in and day out, it was really tough,” he said. During the period, Mr. Negi and Ms. Talaulikarworked from eight-thirty in the morning until two a.m. Many would question, after all the technical difficulties that arose from the new schedule, the purpose of such a shift. According to Mr. Davies, it was introduced to “fit middle years and upper years together a lot better,” as well as transition into the IB Diploma Programme next year. He further clarified that this is so because the two-week schedules allow for a lot more flexibility, which is required for the DP curriculum. This year’s grade 10, or the Class of 2021, is the first class at Woodstock that will experience the DP curriculum. He said that the double blocks were necessary for AP science labs to “happen during the day,” instead of having them take place after school like last year. “The reason that I like the schedule even though it might not be the best is that it trades off for after-school labs,” Garg said. Others thought that the idea of double-blocks was simply brilliant, because of the flexibility, as well as, the amount of work that could be accomplished. “It gives me, if I want to do, the scope to do some really fun stuff. I think it’s brilliant,” Mr. Davies said. Vora, too, really likes the concept of block periods. “The block periods are nice; you get a lot of work done in that,” he said. Although the majority of the science students have expressed their approval of the block periods, several staff and students shared distinct views. Mrs. Nishtha Daniel, the Advanced and AP Chemistry teacher, is grateful that there are no more after-school labs. Mr. Tarun Seth, the head of the math department and AP Calculus teacher, and Mr. Ed Beavan, AP World History and Politics teacher, too expressed the same concerns. “Block periods for grade 12 is fine, but for grades 9 and 10, I need to follow a slightly different strategy because they can not even focus for even 30-40 minutes,” Mr. Seth said. Mr. Beavan added that he “personally did not ask for” the block periods, unlike many of his colleagues in his department. “I’m not sure they’re the best for history. It’s quite a long time to concentrate,” he said.